Our first module came to an end, which unfortunately meant it was time to say goodbye to Dino and his adorable field assistant Barabara. 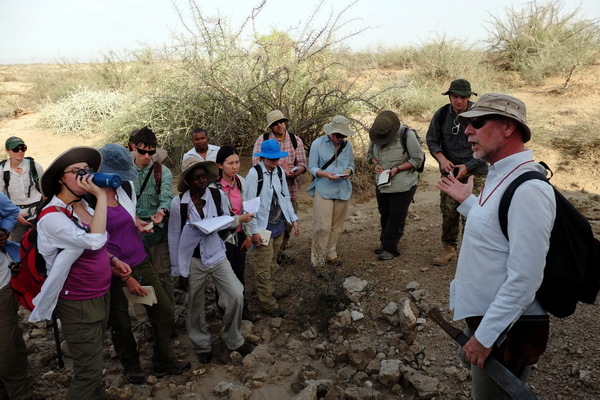 Ecology has set the stage for the rest of the Origins Field School, especially our next adventure, geology. Geological processes that have formed our current ecology have not changed throughout time. Thus understanding what we see today can give us insight into what occurred in the past. 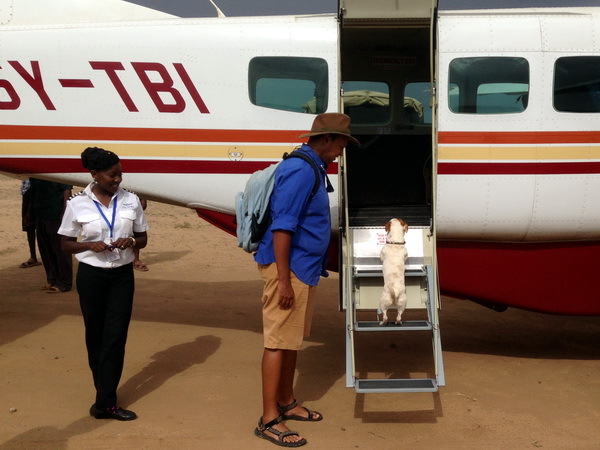 Saying our goodbyes to ecology Professor Dr. Dino Martins and his field assistant Barabara! Photo credit Deming Yang. 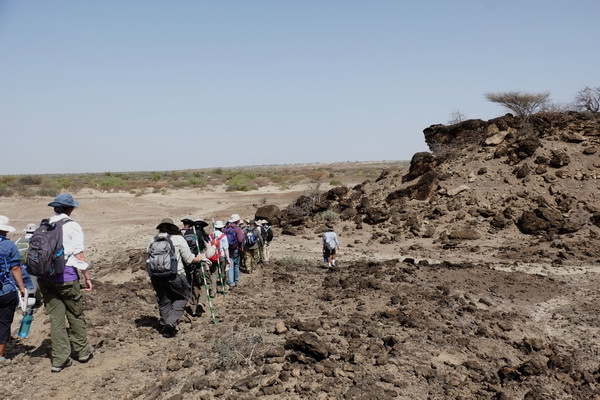 The Turkana Basin has been a geological research destination for many decades. This is due to its unique preservation of sedimentation and tectonic activities and also the ability to infer past climatic changes from that preservation. Among the researchers that have worked in this area are the professors for the geology module, Dr. Craig Feibel and Dr. Bob Raynolds. 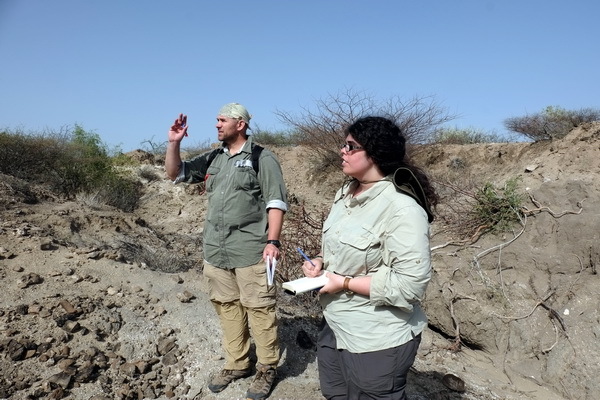 Both of them have conducted research in the Turkana Basin for over 35 years! 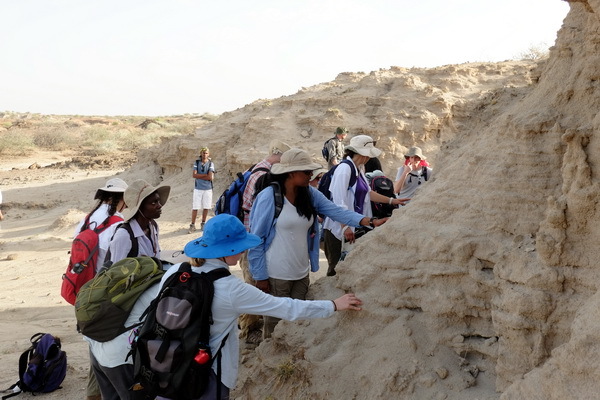 Professor Craig Feibel showing the students how to take measurements of the outcrops. Photo credit Deming Yang. Dr. Bob Reynolds showing the students an ancient stream that came and went across the landscape! Photo credit Deming Yang. 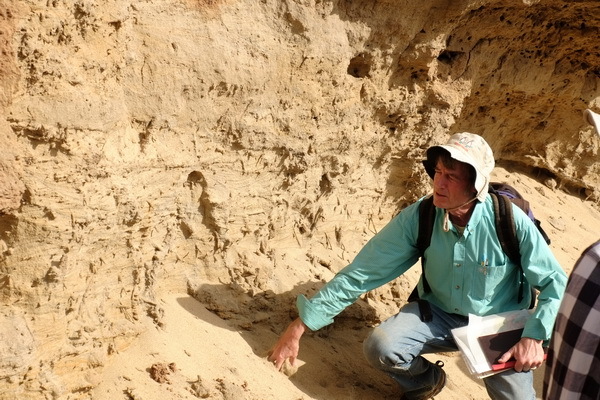 Dr. Feibel is a professor at Rutgers University and is an instructor in both the Anthropology and Geology departments. 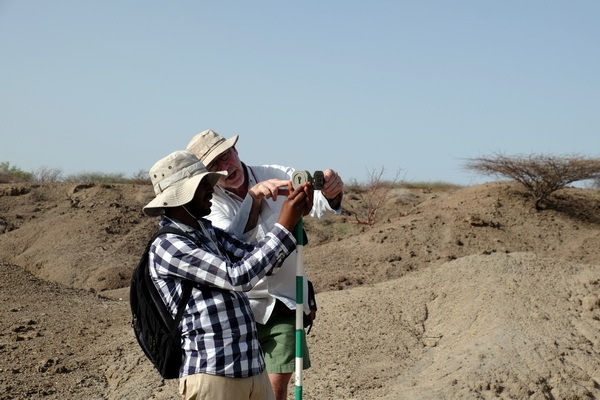 His research involves the investigation into the geological context for evolution and establishing the geological framework behind the extraordinary archeological and paleontological fossil record in the Turkana Basin. 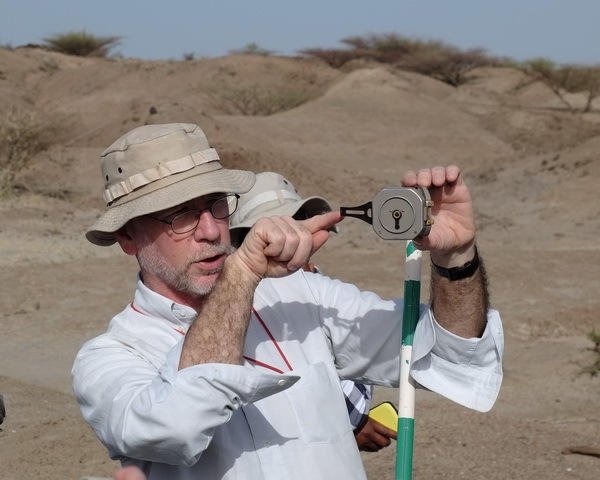 Dr. Bob Raynolds is a geologist from the Denver Museum of Nature and Science where he currently researches sedimentation in the Denver Basin, the geology of aquifers and climate change. Both aim to teach the students how one can reconstruct ancient environments by using geological knowledge! Students take a close look at a thick layer of volcanic material known as tuff. Tuff is often used for the dating of fossil and archeological sites! Photo credit Deming Yang. As Dr. Raynolds mentioned to the students, “Geology lets us know the history of the world”. Each rock tells us a story of how it once was, and how it came to be what it is today. 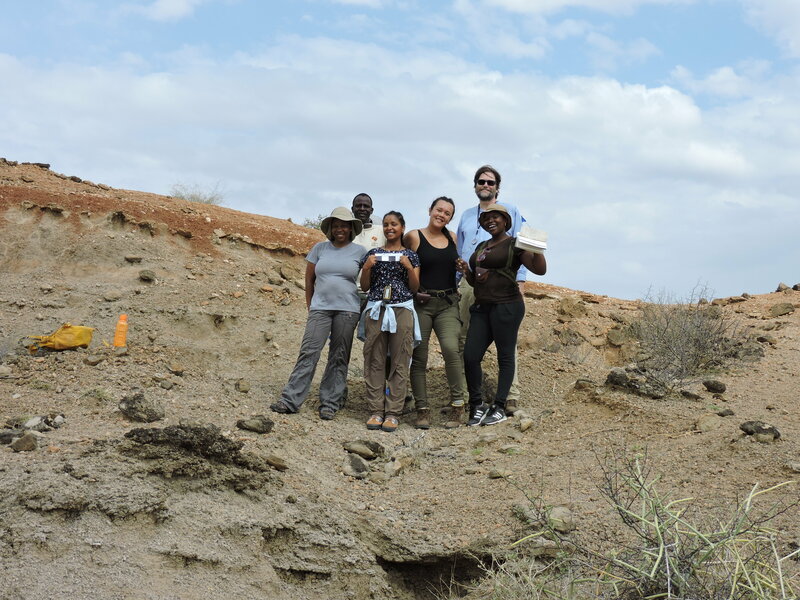 To show the students this, Professor Feibel and Dr. Raynolds brought the students out in the field to look at various outcrops. The students approach one of Dr. Raynolds favorite outcrops. Even though it may just look like large rocks to the untrained eye, it is actually representative of where a river used to flow! Photo credit Deming Yang. For millions of years, Lake Turkana has oscillated between being a lake and a river. Thus, one major paleoenvironmental question is whether the geological formations that we see today were once part of a lake or a river system. 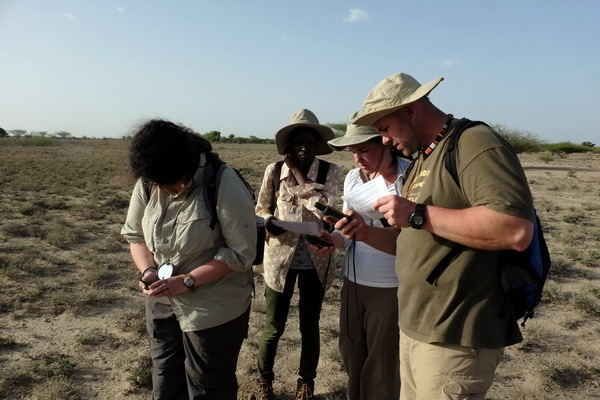 Lucky for us, with geological knowledge we can become paleoenvironment detectives and look for clues within the sediment. 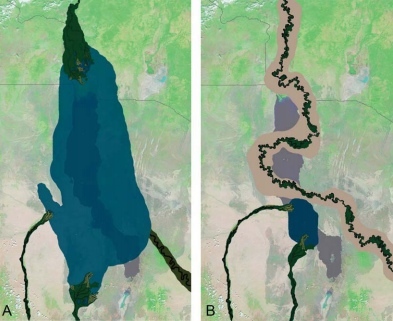 A Shows the Turkana Basin during a lake system 4.1 million years ago, when the lake was actually larger than it is now. B shows this area when it was more characteristic of a river system 3.97 million years ago. The gray area on both pictures shows the current Lake Turkana. (Feibel et al. 2011). For example, due to the kinetic differences between a lake and a river, we often find much finer grain sediments (such as clay) within a lake and larger grain sediments (such as sand and pebbles) within a river. This is because the flow of water in a lake is much slower than that of a river, so any large grain sediments get stuck when the water stops flowing fast enough to carry them. Professor Feibel showing the students the different sediment layers that makeup the dynamic lake river system of this area. Photo credit Deming Yang. Another major clue in investigating paleoenvironments is the biological material found within the sediment. Not only are different organisms found in different environments but also the characteristics of the environment can affect the distribution of the biological material that is preserved. Lets take the case of a large bed of molluscs shells. This area was likely not terrestrial in the past because the molluscs lived where they bed of shells were found. 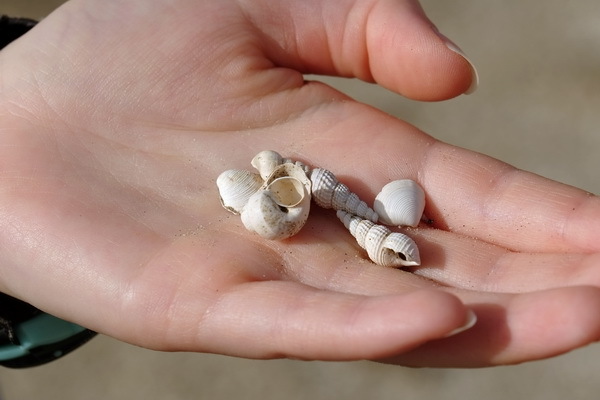 This layer was also more likely to be deposited in a lake than a river because the flow of the water in a river would make it difficult for a large layer of mollusc shells to accumulate. Thus this sediment was likely a lake! 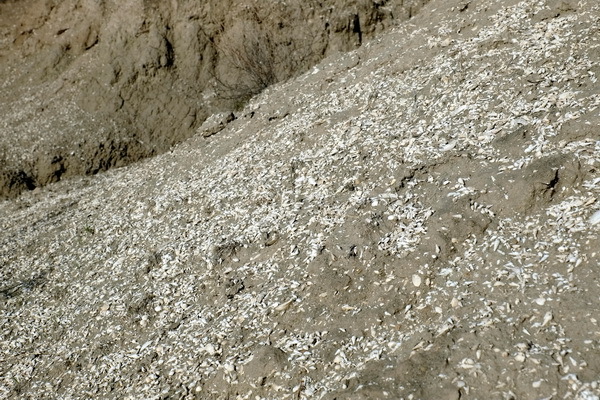 A large layer of shells embedded in mud sediment. This area used to be at the bottom of a lake a long time ago! Photo credit Deming Yang. TA Laura holds the clues to the past. Photo credit Deming Yang. Like true detectives, the students were also given necessary tools to aid their geological investigations. These include a gps, brunston compass and jacob’s staff. 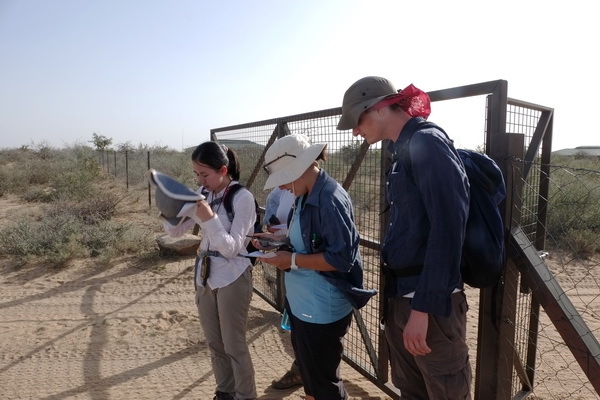 The students used these devices to obtain directions and measure the outcrops. 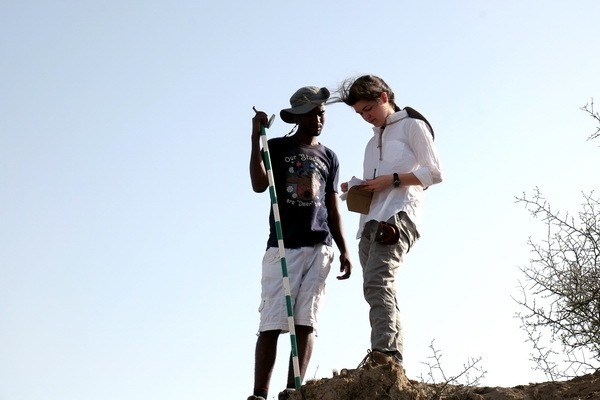 Yared obtains a measurement of bedding thickness with the help of Professor Feibel. Photo credit Deming Yang. 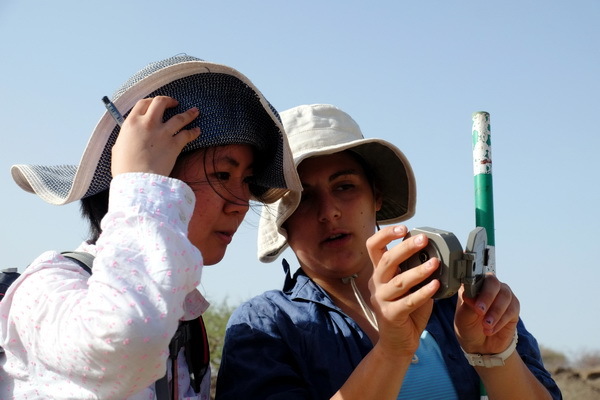 Nicole and Goitom record their measurements at the top of their section. Photo credit Deming Yang. Yishan and Leah work together using the Brunton and Jacob’s staff. Photo credit Deming Yang. Tom and Jessica take observations in the field. Photo credit Deming Yang. To test the students GPS skills, they were sent on an orienteering course outside of the TBI compound. GPS devices are vital to us in the field because they allow us to locate what we are interested in, and help us get home! The student’s goal in the orienteering challenge was to follow a set of instructions as efficiently as possible; which included going to and collecting coordinate points. Yishan, Leah and Charlie at the starting line for the orienteering challenge. Photo credit Deming Yang. Jessica, Tom, Ester and Leah work together to figure out where to go next during the orienteering challenge. Photo credit Deming Yang. 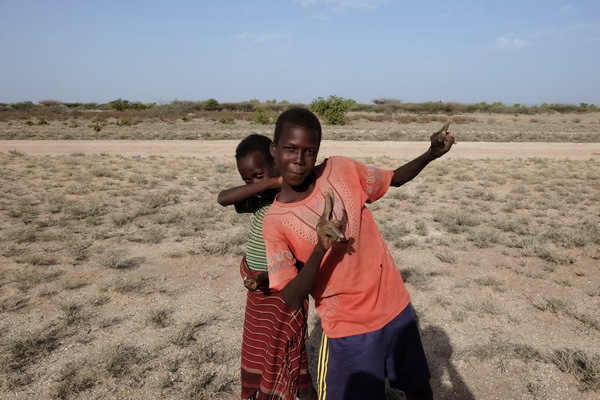 Local kids entertained by the students during orienteering. Photo credit Deming Yang. 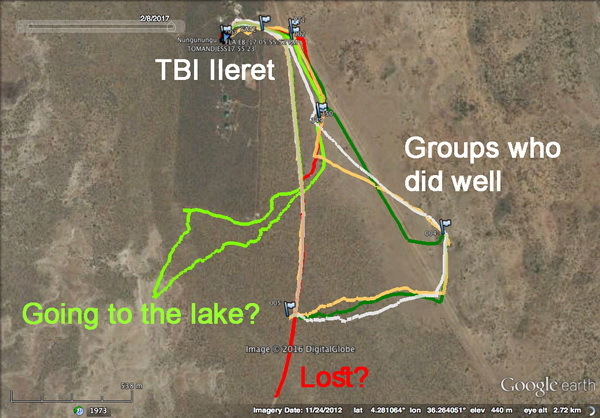 GPS traces of where the students went during the orienteering challenge. While some took interesting paths, all made it back to TBI! Photo credit Deming Yang. Other disciplines, such as paleontology and archeology, that do research in this area heavily rely on the reconstruction of past environments to aid in their fossil and artifact quests. 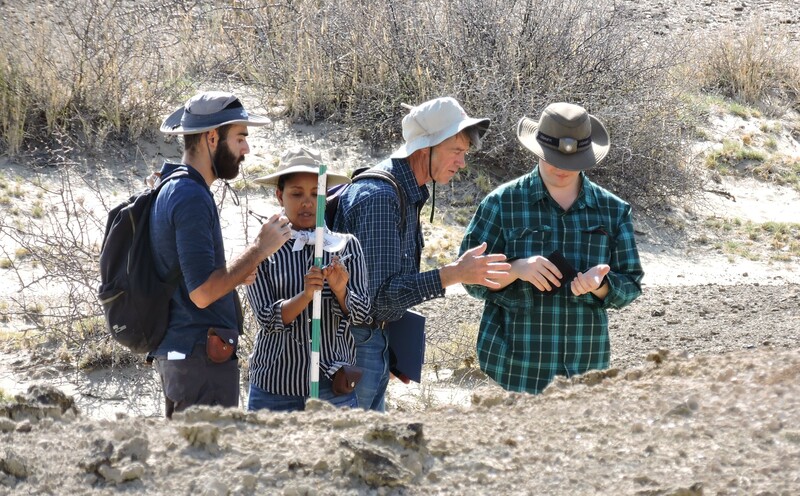 By knowing what type of sediment, where it came from, and how old it is, a paleontologist or archaeologist can know exactly where to look to find what they are interested in. For example, if you were looking for a hominin fossil, you would not want to look in sediments that used to be the middle of a lake! 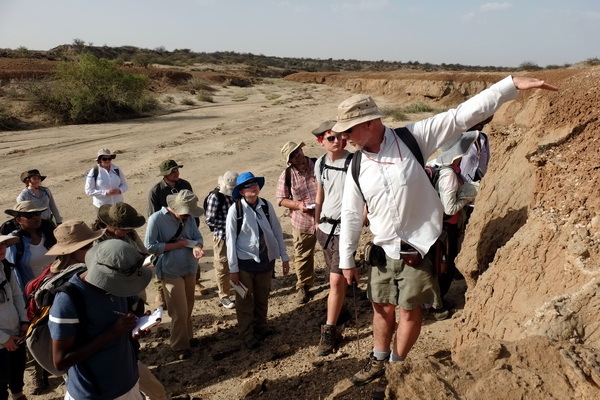 Geology provides the context for many other disciplines in this area, and the students look forward to learning more in the rest of the module. 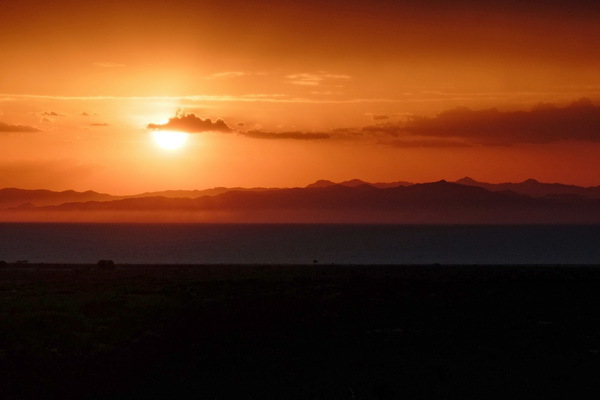 Sun setting over Lake Turkana. In the words of Dr. Raynolds, “It truly is amazing to have a lake in the middle of the desert”. Photo credit Deming Yang.